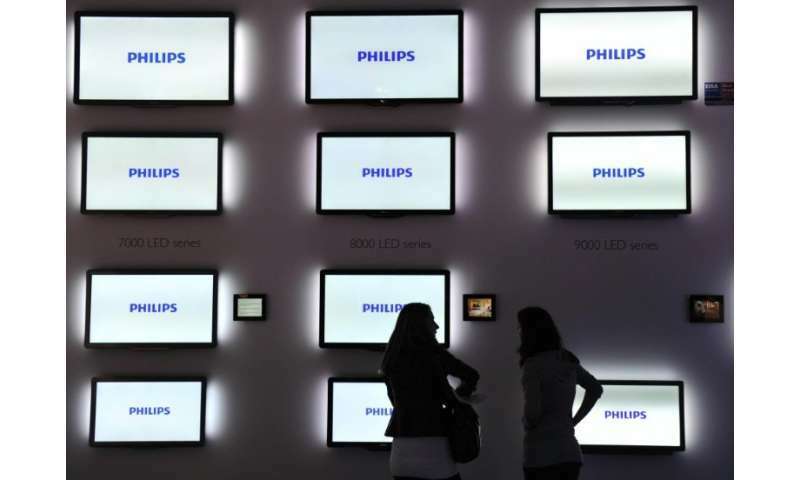 Dutch electronics giant Philips Monday posted a 27 percent drop in first quarter profits, hit partly by the costs of restructuring and some acquisitions as it evolves its portfolio. Net income fell in the first three months to 94 million euros ($115 million) compared to 128 million euros over the same period in 2017, the company reported in a statement. Sales in the first quarter stood at 3.9 billion euros, 2.0 percent down on 4.03 million euros in 2017. But the company stressed that was a comparable growth of 5.0 percent taking into account such issues as currency fluctuations, and the shedding of the Philips Lighting arm. "While there is more work to be done, 2018 started well," said chief executive office Frans van Houten. Restructuring and acquisition charges came to a hefty 64 million euros in the first quarter of 2018, compared to just 24 million in the same period last year. The 2017 first quarter profits also got a boost from a 59 million euros gain from selling some real estate. The group, which sold its first light bulb a few years after it was founded in 1891, moved to list its Philips Lighting division in mid-2016 which joined the Amsterdam stock exchange, the top-tier AEX, in March. Philips is a global multinational with more than 74,000 employees and income streams in over 150 countries. Van Houten hailed sales growth in early 2018 particularly in the diagnostics and treatment area, up in comparable figures some 9.0 percent on last year. "Across our markets, we continue to see strong customer interest in our innovations," said Van Houten. The company had also "signed eight long-term strategic partnership agreements across the US, Europe and the Middle East," he said, citing an 11-year deal with Britain's Wye Valley NHS Trust to provide the latest diagnostic imaging equipment. Philips remained on target for the 2017–2020 period of 4.0 percent to 6.0 percent comparable sales growth, he added. Van Houten, whose second term at the head of the company is due to end in a year, told reporters on a conference call he would be ready to stay on for another term, if shareholders wished.